Stefan Schreiber | Athlete: Power, power, power!! I am finally a proud owner of a Power Tap SL+. This was certainly the missing piece for my goal to finish Top 5 (M30-34) at the Ironman World Championships this year in Hawaii. Luckily, I was able to get it for a sweet deal! Thanks to Travis! I was playing around with it these days and also bought the book "Training and Racing with a Power Meter" by Allen and Coggan. For me as a scientist this is the most amazing thing to collect data on myself, evaluate it and try to find ways to improve these numbers. Now I am truly my own experiment! 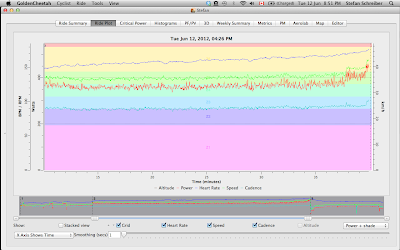 Ten days ago I did my first power workout ever and my first VO2max, i.e. all out for 5 min and I averaged 422 watts by 79.5 kg (5.31 watts/kg). Looking in the book I mentioned above, there is a Power Profile Chart (downloads as an excel file), which puts me right in the middle of Category 2 riders. I was very happy with this first result. Last week I started the VO2max booster program by Jesper Bondo Medhus. Since I really like his time efficient and interval based training approach, I contacted him to ask whether he would be able to plan my last 14-weeks for the big day in Hawaii. He agreed since he finds my goal quite interesting. I can't wait to see how my bike performance will change. 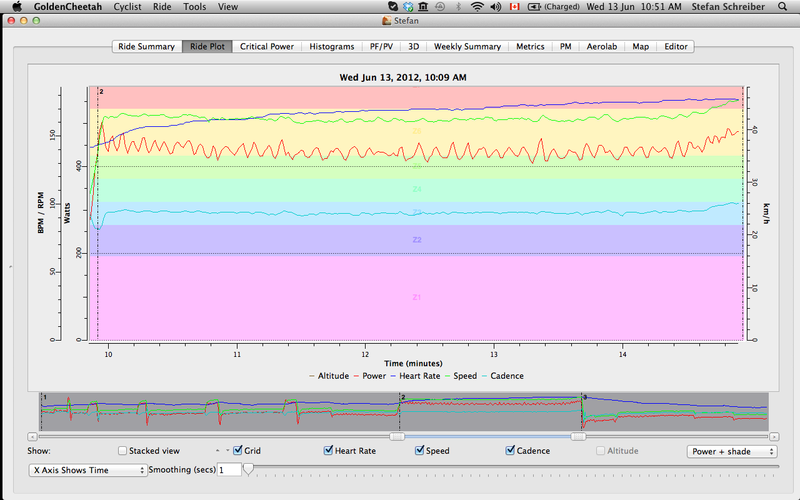 I never worked with a power meter before and I never really did real interval workouts on the bike. But this is exactly what I will do now and this will be the recipe for a fast bike in Kona. When Jesper agreed to write me a 14-week training program he also wanted me to do again a 5 min and now also a 30 min all-out ride. I did these rides today and yesterday (see below) and averaged 438 watts by 79.5 kg (5.51 watts/kg) as well as 368 watts (4.63 watts/kg) for 5 min and 30 min, respectively. 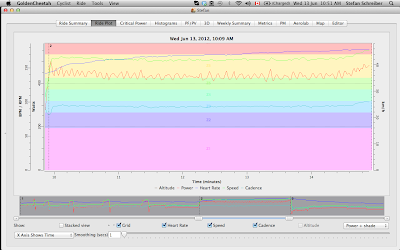 My average heart rates were 168 and 160 bpm with an average cadence of 94 and 91 rpm. Using these test results, I calculated my Functional Threshold Power (FTP) of 354 (4.45 watts/kg), which again puts me in Category 2. 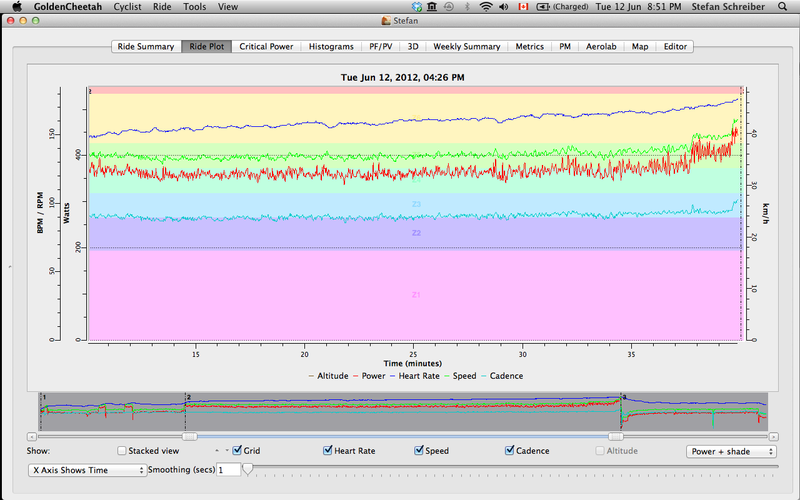 FTP was calculated using Cycling Power Model and Golden Cheetah and both programs gave me the same FTP. The later is the program that I am using to manage my own power data. This weekend I will also do the Chinook Half in Calgary and I can't wait to see how my power values compare to cycling on the road (I did all my testing on my stationary trainer).